The Galaxy Note 9’s launch event saw the appearance of Tim Sweeney, CEO of Epic Games, the company that made the massively popular multiplayer game Fortnite. Sweeney announced the release of the Android version of Fortnite onstage as an exclusive for Samsung devices. The game isn’t just exclusive to the Note 9, unlike what the rumors and leaks had suggested, but is also available for the Galaxy S7, Galaxy S7 edge, Galaxy S8, Galaxy S8+, Galaxy S9, Galaxy S9+, Galaxy Note 8, and the Galaxy Tab S3. Fortnite for Android will be exclusive to Samsung’s devices till this weekend before opening up to other Android devices. The game’s still in beta and the graphics settings are limited for all of the aforementioned Galaxy devices, but you can otherwise jump in and start playing. Don’t be fooled by all the fakes that have already started showing up on the internet, though. You can only download Fortnite from Samsung’s app store at the moment for it to work. If you have been wondering how you can do that on your Galaxy phone or tablet, we have a step-by-step guide to help you on your way. Remember that only the devices mentioned above are supported, so the instructions below aren’t of any use for other devices. Step 1: On your phone or tablet, open the Galaxy Apps app from the Samsung folder in the app drawer. If you can’t find the app, just enter ‘Galaxy Apps’ in the search field at the top of the app drawer. 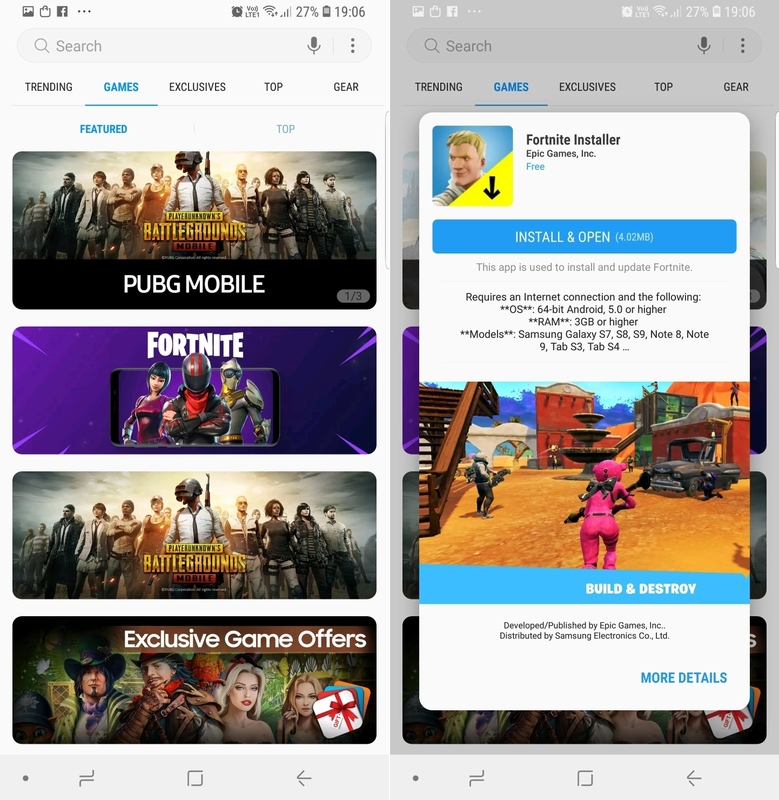 Step 2: You should see a banner ad for Fortnite as soon as you open Galaxy Apps. Click on the banner, then tap the Install and Open button to download the Fortnite Installer app. That’s right, the Fortnite app in the Galaxy Apps store is just the installer, and it’s inside this app where you will download the full game. Alternative: If you can’t see the banner, just click this link on your phone or tablet to directly go to the Fortnite page in Galaxy Apps and press the Install button. If this link doesn’t work, then the game may not be available in your country just yet. Step 3: Once the app is installed, it should open automatically. If not, just tap the Open button in Galaxy Apps to start the Fortnite Installer. You can also open the Fortnite Installer app from the app drawer. Step 4: The Fortnite Installer app will immediately start downloading the actual Fortnite game, but you will first have to give it permission to access your device’s storage. To do so, just follow the prompts on screen and press the Allow button when presented with the option. Once Fortnite is installed, you can tap the Launch button inside the Fortnite Installer app to start the game. You can also start the game by tapping its icon in the app drawer. 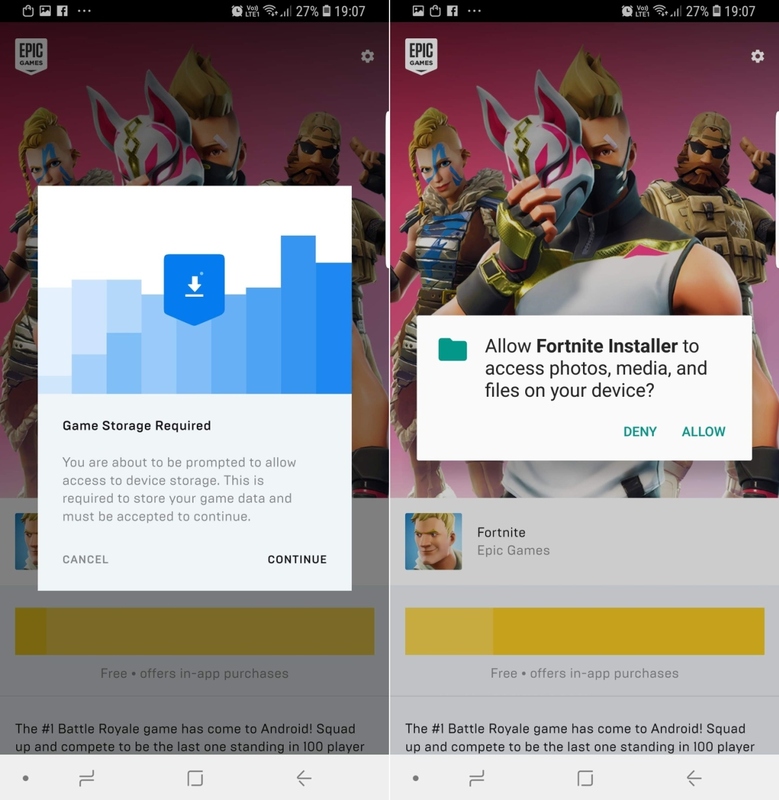 The Fortnite Installer app will also stay installed on your device, and since the Installer app is used for updating the game, don’t uninstall it (Fortnite isn’t coming to the Play Store, so the Fortnite Installer becomes necessary for game updates). How are you liking Fortnite on your Galaxy device in its current form? why not connected with google account ? always when connected with google give error and refuse to connect ? Step 1: Download it, Step 2: Install it, Step 3: Run it, Step 4: Get very very disappointed, Step 5: Uninstall it. Joke aside, they shouldn’t have released FN for the S8+. Terrible graphics, glitchy, slow and barely playable, it is not worth anyone’s time. They should not hide behind the beta label, this is an alpha version at best. Didn’t actually play a game past the insertion stage, but S9+ gets high graphics option and yet it’s kinda pixelated. Just like on Note 8 with mid setting. It looks like $hit on my S7 edge. It is limited to low quality only. Same on the S8+. Plus it’s glitchy af.